I've used the onesie, star and CONGRATS sentiment from Hangin' Out and tried my first air-brushing. 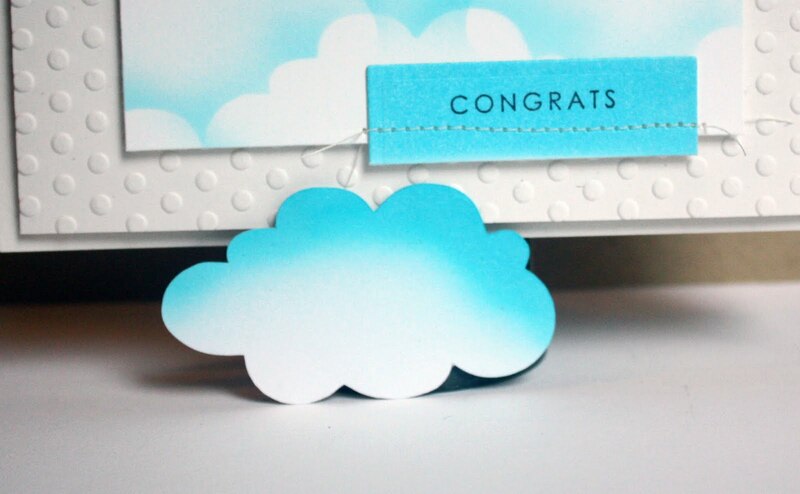 I found Leigh O'Brien's cloud backgound tutorial helpful and her creations totally inspiring as you'll see in my second card below. This actually is close to Sankari's sketch but rotated to the left 45°. Since I was going with 'clean & simple' I worked with last week's splitcoast CAS114 inspiration challenge too. To make my cloud pattern I just created ovals and circles in various sizes in my Silhouette software and welded them together then cut on cheap cardstock (the stuff I give my kids). I added a little white flock to the stars, which might be tricky to see in the photo. To create my own custom blue cardstock, I coloured a white scrap with the same copic marker I used for the blue onesie and then stamped the sentiment. The clothesline is a great use for all of the divine twine I now have in assorted colours!! Why did I create two cards for today? I thought this next one was more a CASE than a CAS card. I loved Leigh O'Brien's baby bear, and well, you know I have bears and balloons of my own! 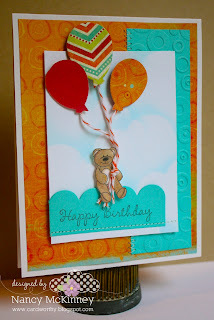 The balloons are cut with the Make a Wish Balloons dies and this sweet bear is from Hangin' Out too. The sentiment is from In the Park. I used a slightly different cloud template and shade of blue copic but the same technique. Thanks Leigh! These are both super cute!! I love the cloud background you have created on that first one...and the hanging onesies are adorable!! Both of those are utterly darling!! So sweet!!! W*O*W Nancy these are BOTH fabulous!!!! Love the clouds too. I have to try this technique. These are both AWESOME Nancy! LOVE the different colored onesies!! These are very sweet, I am impressed you had time to make two!! Look at those awesome clouds! What a great idea. Both of these are just fab. Thanks so much for sharing! 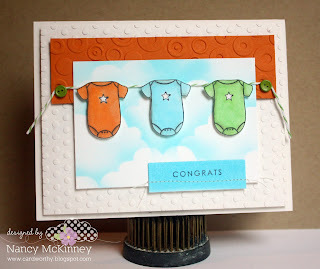 Two cute cards - love the onesies hanging on the line! Oh these are both adorable - I especially love the onsies! Great CAS cards! Oh how cool! You did an awesome job with those clouds. Your airbrushed clouds turned out fantastic!! Your cards are so sweet! Both cards are absolutely adorable...such cute images and I just love the CAS designs!!! wow. i love that onesie card. i have thing for onesies. so cute! tfs. Both of your cards are just adorable! 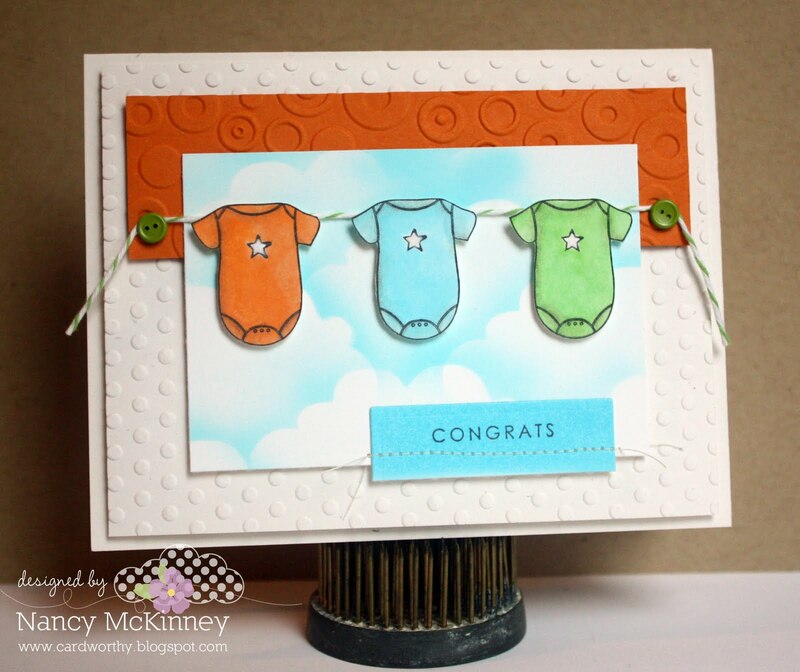 I love your cloud backgrounds, the embossing on the first card, and your use of twine on both! Just wonderful!